Margaret Thatcher dead: A look back at her snarky rebuttals to Labour leaders. 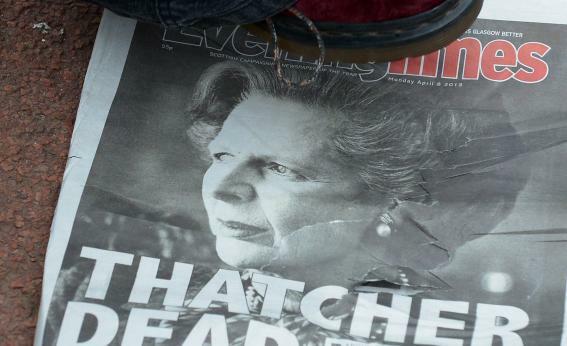 A woman stands on a newspaper displaying a picture of Baroness Margaret Thatcher on its front page as members of the public gather in George Square to mark her death on April 8, 2013 in Glasgow, Scotland. The Iron Lady, the 2011 Meryl Streep Oscar-bait bio of Margaret Thatcher, failed for a large number of reasons. One that rankled me was the absence of any actual Thatcher quotes. Limited by copyright law, the filmmakers couldn’t quote much of what Thatcher said during PM’s questions, or at party conferences. If they’d wanted to explain just what Thatcher meant, as an advancer of policies, this would have crippled their movie. But they went on to make a kind of scattered character study about an old woman who broke barriers at the expense of yadda yadda yadda. Luckily, a small group of YouTube users have seen fit to capture Thatcher moments and upload them. In her day, there were two weekly 30-minute rounds of PM’s questions. (Tony Blair consolidated this into single 60-minute rounds.) Thatcher, faced with a series of more-charismatic Labour leaders, dispatched them with figures and snark. Americans know Kinnock, if they know him at all, as the orator who was ripped off (accidentally!) by Joe Biden. Thatcher never tried to contain her disdain for him. When the B-team came to play, Thatcher had an even easier time. It’s fitfully compelling stuff, but here’s the reason people keep putting it online. In our current crisis, they believe that Thatcher was right, and saved the UK from the disastrous trends of consolidation with Europe.